Chabad at CSUN is the warmest place to be away from home.. It is a home where all are welcome regardless of background or affiliation. It is a place where every Jew is family. It is a Jewish student organization at CSUN that provides educational, social, and recreational programming for students and faculty. It is directed by Rabbi Chaim and Raizel Brook. 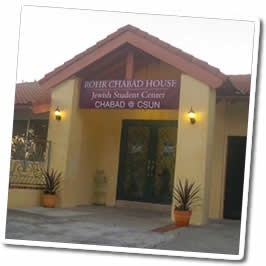 Chabad at CSUN is a branch of Chabad of Northridge directed by Rabbi Eli and Tzippy Rivkin.